Crowdfunding site Patreon, which currently helps around 100,000 YouTube creators and others make a living out of their work, has just announced some major changes to its pricing system. Launching in early May, the new plans for creators comprise Patreon Lite, Patreon Pro, and Patreon Premium. Before, the platform deployed a single price plan for all Patreon creators. It’s important to note that the changes will only really affect new members of Patreon. In other words, existing Patreon creators will see no increase in the so-called “Patreon fee” — the amount that the company takes from donations — though they will be affected if they’re interested in making use of any new features launching soon. Patreon currently charges creators 5 percent of supporters’ subscriptions, but the new plans do shake things up a bit. Patreon Lite, for example, retains the 5 percent cut for the company and comes without any tiers and benefits (different tiers can offer supporters different benefits according to the amount of their donation). This is the ideal plan for quick setup. Patreon Pro is close to the current plan and is the one existing creators will be automatically placed into, with the 5 percent rate remaining. New sign-ups, however, will be charged an 8 percent Patreon fee. Patreon Pro offers features such as membership tiers, analytics and insights, and unlimited app integrations. 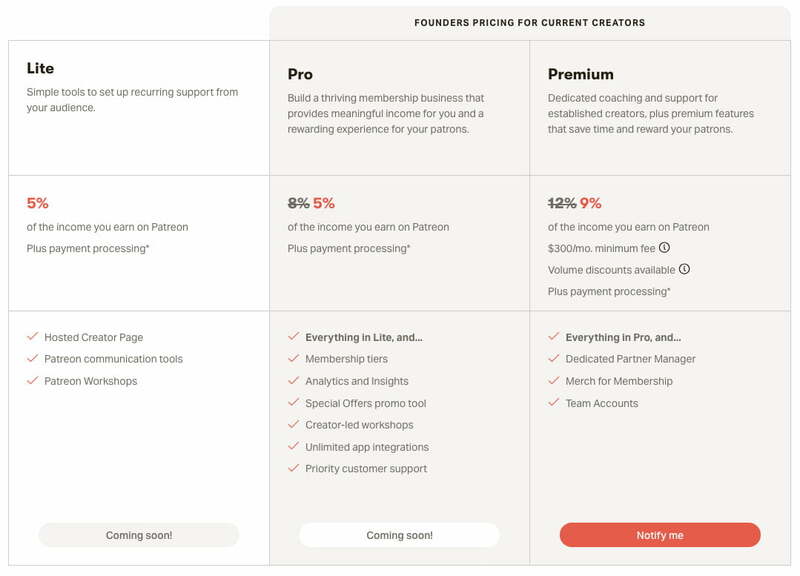 Geared toward larger creator operations, Patreon Premium offers everything in Pro, plus the services of a dedicated partner manager and team accounts, among other benefits. Premium, which is being rolled out gradually, takes a 12 percent cut (9 percent for existing creators who want to upgrade from Pro) and also charges a flat fee of $300 a month. Pledges of more than $3 will use the new industry-standard rate of 2.9 percent, plus 30 cents per successful payment. For all payments from supporters outside the U.S. using PayPal, there will be an additional 1 percent surcharge. Patreon is keen to point out that these rates are for creators who join the platform after the new plans launch in May, in other words, creators who launch on Patreon before these changes will retain their current processing rates. “These changes will help us invest in the features and services all our creators depend on, and create a strong and independent Patreon that creators can build their businesses on for decades to come,” the company said in a message on its website. Mindful of the mess it created in 2017 when it was forced to cancel fee changes after they caused consternation among its creator community, the company promises that this time around it designed the new plans with far greater care after discussing the changes with “thousands” of Patreon creators.